Is the water tank of your diffuser gets too small for all-night humidifying and always gets waterless in the late night? Just turn on the HACME 550ml essential oil diffuser and enjoy your personal aromatherapy, yoga or spa! 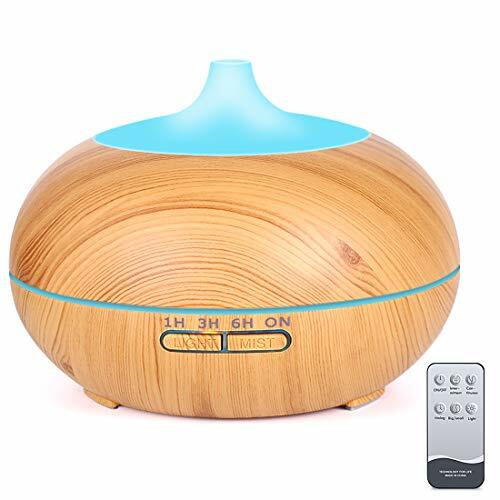 Unique 550ml wood grain essential oil diffuser provides you extra 60% humidification than normal 300ml. - Please long press MIST to switch the working mode from Continuous to Intermission. - Please long press LIGHT to switch the working section from one to another. We offer customers a 12-Month replacement warranty and money back guarantee! If you're not satisfied for any reason, you'll get a hassle-free refund or replacement. No questions asked. Buy with confidence we are here to give you the best customer service. ★ UNIQUE AND COMPACT DESIGN: This aroma diffuser with wood grain looks very natural and primitive. The cap is easy to take off, need't unscrew the cap with great force. ★ LARGE CAPACITY AND GREAT MIST OUTPUT: This aroma humidifier can hold up to 550ml water and run continuously for 10 hours. Automatic power off when water used up, which ensures safety. ★ 100% SATISFACTION GUARANTEE: We offer customers a replacement warranty and money back guarantee! If you're not satisfied for any reason, you'll get a hassle-free refund or replacement. No questions asked. Buy with confidence we are here to give you the best customer service. If you have any questions about this product by HACME, contact us by completing and submitting the form below. If you are looking for a specif part number, please include it with your message.